As much as I love Stockholm, I really wish I could have waken up in Paris today. It didn’t matter that Stockholm pulled its most beautiful October sun or that the red and yellow leaves brought magical colours to the city today. As beautiful as a city can be, it cannot compete with people. But don’t worry Stockholm, I still love you and when I realized that I was not in Paris this morning I decided to make the most of my day. 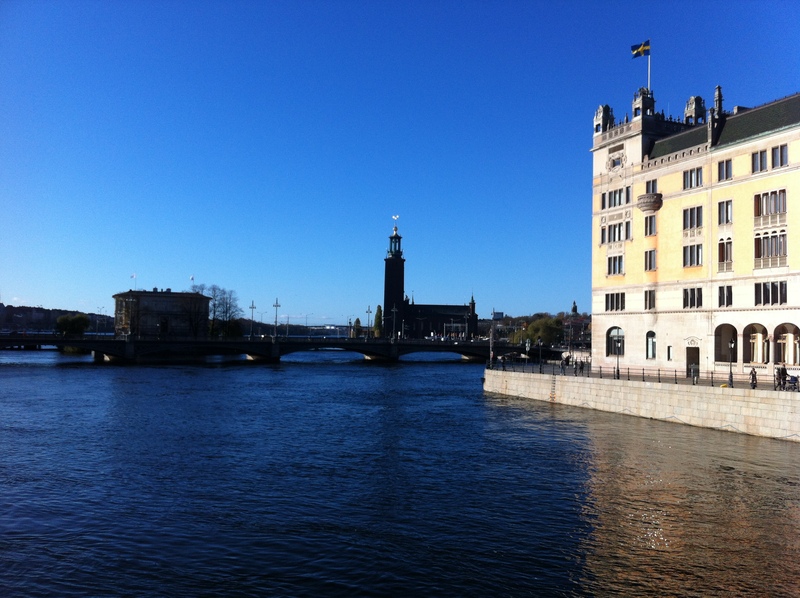 It started with a nice run from Södermalm through Kungsholmen and back home through Gamla Stan. Many friends told me about a French café in Kungsholmen which I absolutely had to visit. Short of being in Paris, I thought this would probably be the second best thing to do this morning. Unfortunately, I went out for my run a bit later than I had hoped and by the time I got home and was ready to go out again, it was almost 11:00 am. Based on my previous experiences in Kungsholmen, and on what a colleague who lives next to the French café had told me, I fully expected the place to be packed. And it was. Thankfully, Kungsholmen is a very cool neighborhood of Stockholm and there is no shortage of nice cafés in the area. The sun was shining, people looked happy and I was in no rush to go inside. However, at some point I started to get hungry and I decided that it was time to reward myself for the morning run. This is when I noticed Caffè Ugo! 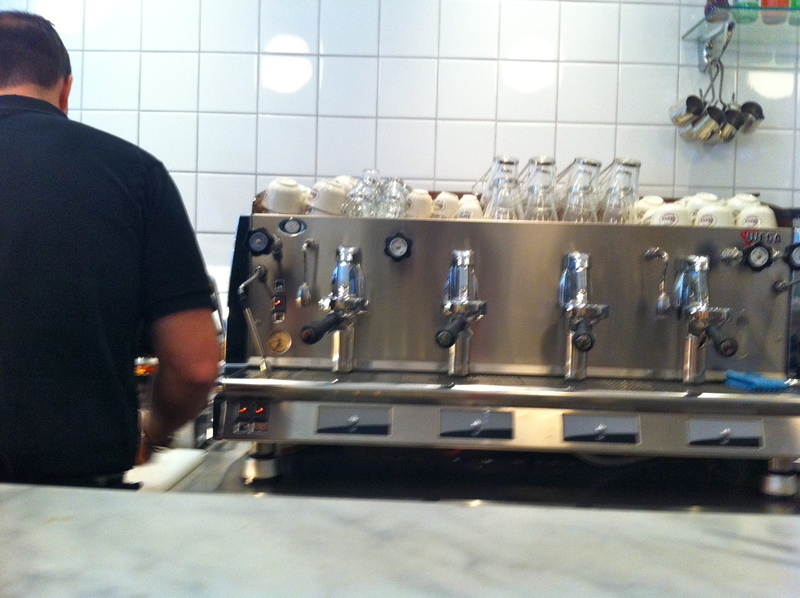 Caffè Ugo is an espresso bar which is importing its coffee directly from San Remo. While San Remo is as far as it can be from Sorrento, I was still happy with the Italy connection in my scenario! Caffè Ugo also has a partnership with the bakery Lux and one can buy all kind of nice bread at Ugo as well. I was hungry but I did not really want to have a full lunch at Ugo. I had good soup at home so I just needed something to keep me going for a few hours so that I could enjoy Stockholm’s sun. 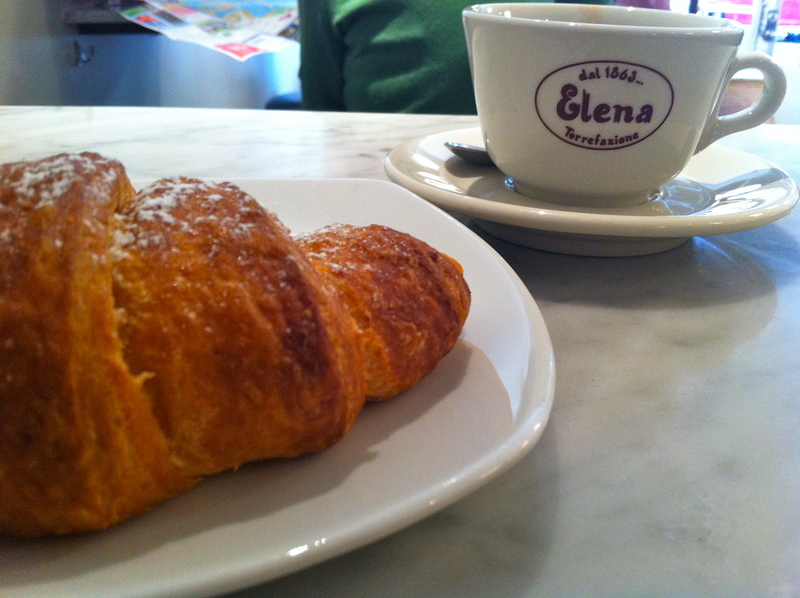 I had a nice double espresso with an Italian croissant. I think Stockholm could feel that I woke up with doubts this morning. She – I really don’t know what the rule is but I decided that Stockholm would be a she – so, she realized that the sun, the red leaves and all the happy people in the streets would not be sufficient, and she decided to go with a public statement. I love you too Stockholm! I love this post! You’ve reminded me how much time I used to spend alone, on my private love affair with London and how much I miss that now. Of course, I know why it changed. I seem to have made the switch from being an alien to a local and spend time meeting up with friends rather than dining alone. PS I prefer Italian coffee anyway and that first photo of Gamla Stan is stunning. 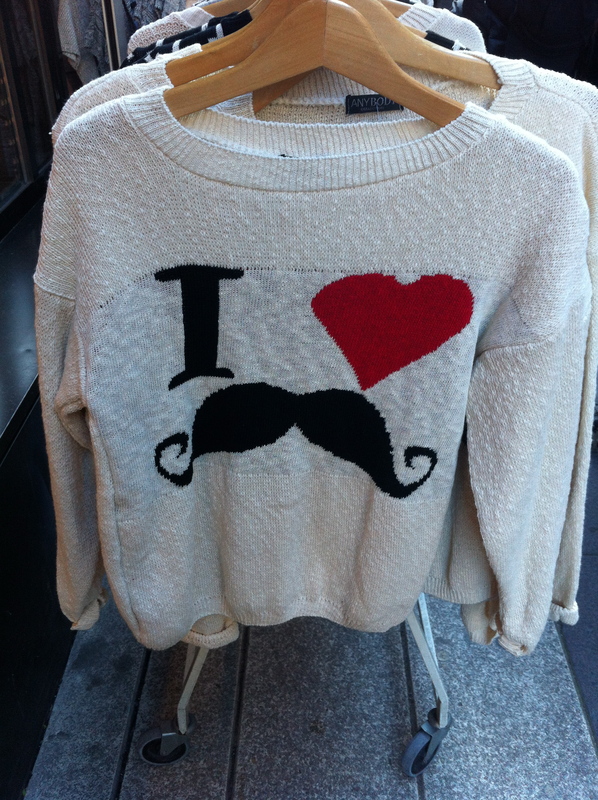 I want that sweater. Seriously. How much is it? Also.. Napoli!? C’est très intéressant ça … 🙂 I’d like to hear more!! I want to!!! Check my fbook for an interesting piece of Swedish culture.